Even if you are researching a soldier who did not serve in the infantry, you will come across frequent mentions to battalions, and it useful to know what they were and how they were structured. Battalions can be written in a variety of ways depending on the author. The Battalion will always precede the Regiment. The exact Battalion of a Regiment will usually be abbreviated as they become rather cumbersome in the text when repeatedly given in full e.g. 1st Battalion, The Essex Regiment becomes 1/Essex or 1st Bn Essex etc. If you’d like to find out which battalions a soldier served with abroad during the First World War you’ll need to consult their Medal Roll entry or look for a Service Record. In the British Army, infantry Regiments were made up of a number of different Battalions. In 1914, the establishment of an infantry Battalion was 30 officers and 977 other ranks, giving a total of 1007. A Battalion was commanded by a Lieutenant-Colonel and was divided into a Headquarters, 4 Companies and a Machine Gun Section. Headquarters consisted of the following officers, a Lieutenant Colonel, a Major as Second-in-Command, an Adjutant, Quartermaster and Medical Officer. The Headquarters also contained specialists such as signallers, drivers, pioneers etc. In August 1914, a Machine Gun Section consisted of 2 machine guns and 16 men commanded by either a Lieutenant or Second Lieutenant. The first posthumous Victoria Cross of the First World War was awarded to Lieutenant Maurice Dease who was in command of the Machine Gun Section of the 4th Battalion, Royal Fusiliers at Mons. 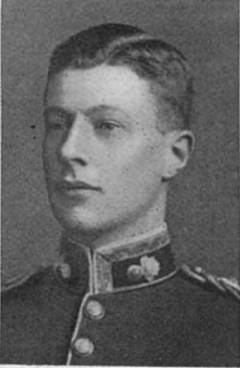 Lieutenant Maurice Dease who was killed in action at Mons on 23 August 1914 while in command of his Battalion’s Machine Gun Section. This photograph appeared in The Sphere which is an excellent newspaper to search for officers who died in the war. This paper has been digitized and can be searched on FindmyPast. Companies were usually lettered A – D, W – Z or numbered 1-4. At full establishment, a company contained 227 officers and men and was commanded by a Major or Captain. Each Company was further subdivided into 4 Platoons commanded by a Lieutenant or Second Lieutenant. The 4 Platoons in A Company would be numbered 1- 4, in B Company 5-8 and so on. In total, the 4 Platoons would comprise of 8 Sergeants, 10 Corporals, 4 Drummers, 4 Batmen and 188 Privates. Each platoon would then finally subdivide into the smallest unit, the Section, containing 12 men led by a Non-commissioned Officer. Below is an example of the strength of a Battalion taken from the war diary of the 4th Battalion, Royal Scots Fusilier. In a Battalion’s war diary, the strength of the unit will often be written, especially after it has taken part in a battle. 20 May 1915 – Liverpool – 1 to 4 am – Embarked on SS Mauretania. Officers 30, Warrant Officers 7, Sergeants 45, Rank and File 909. Total all ranks 982. 1 Officer and 1 Sergeant, 56 Rank and File, including 8 L.D. Train A.S.C. drivers left at Stirling to follow with horses on another transport. An Infantry Battalion didn’t just consist of soldiers. In August 1914 a wartime establishment of an Infantry Battalion was 13 riding horses, 26 draught horses, 8 heavy draught horses and 9 pack horses. The 43 draught and pack horses helped to pull a 1 horsed cart, 12 2 horsed carts and 3 2-horsed wagons which carried the Battalion’s equipment. There were also 9 bicycles allotted to the Battalion’s signallers. Are you researching a soldier who served in the First World War? 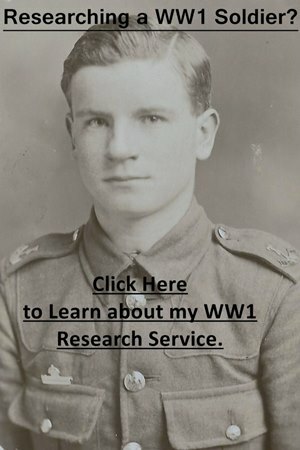 If you are, click on the photograph below to learn more about the WW1 Research service which I offer.